For Susan and me, it’s been an amazing blessing. Both sets of parents have been loving and supportive, knowing when and how to be there for us, and also giving us the room we have needed to grow together as a couple. 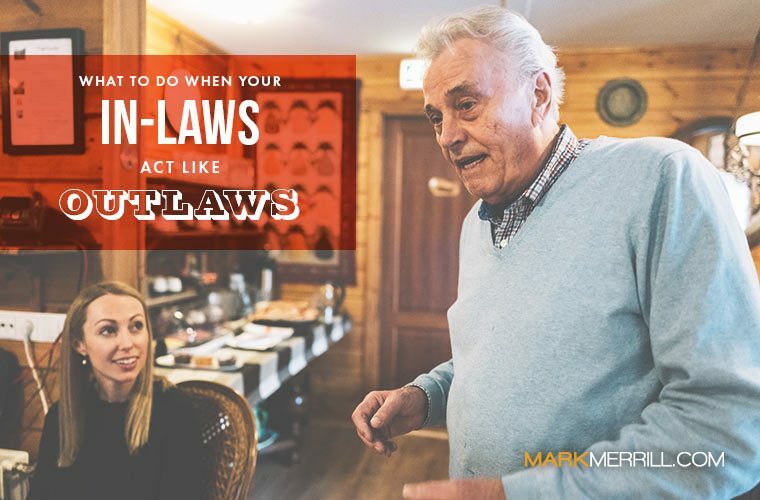 But what do you do if your in-laws turn out to be more like outlaws? Appreciate them for something good. Remember that not everyone is all bad, and you have at least one reason to be thankful to your in-laws: your spouse! Chances are, too, that they have other good qualities if you take the time to look beyond the things that bug you. Acknowledge your different viewpoints. Oftentimes tensions between couples and their parents and in-laws are really about unspoken expectations. For instance, holiday plans—who gets to spend Christmas where—can be a hot button (and in that regard, here are 5 Ways to Honor Your Parents During the Holidays). Her parents may just assume that you both will always go back there for Thanksgiving because that’s just the way they have always done things in their family. They’re not setting out to be difficult; they just haven’t taken into account that things have changed. So when something comes up, try to discern why they are feeling or acting a certain way. Look for the why behind the what. Assume good intentions. Some people are deliberately controlling—they want things their way and they want everyone else to do things their way—but some don’t mean to be. Recently, Susan and I visited our daughter and son-in-law in their new home. I suggested a bunch of home improvement things that I could do with my son-in-law. I thought I was being helpful until Susan told me later that I had come on too strong and a bit controlling, even though I didn’t mean to be. Assess how your parents have shaped you—and how your spouse’s parents have shaped them. Your husband may be gratefully aware of the positive way he was raised. Your wife may not realize quite how much she has been affected by her childhood in a home where there was emotional or substance abuse. Our past experiences significantly define not only how we view our parents, but our spouse too. Knowing your history helps you deal with the present better. Here’s more on How to Become a Student of Your Spouse. Knowing your history helps you deal with the present better. Agree to put your relationship first. As I said earlier, getting married isn’t just a two-way relationship, when you add two sets of parents it becomes six-way—and even more when there is remarriage. But remember that the relationship between the two of you must be your priority. This blog further explores the importance of putting your marriage first. Honoring your parents while also making your marriage your top priority is one of the 11 Things a Husband and Wife Must Agree On. Accept that it is okay to draw boundaries. If you don’t drink in your home, it’s fine to ask your in-laws not to bring a bottle of wine when they come for dinner. If your mother-in-law keeps criticizing your wife’s housekeeping or parenting in a passive-aggressive kind of way, it’s appropriate to privately and gently say that’s not acceptable. Aim to restore or repair the relationship as best you can. If your in-laws are acting like outlaws, remember they are robbing all of you of what should be a blessing and a benefit. Look for ways to love them back into a relationship. You may feel it’s appropriate to limit the time you all spend together under one roof, but that doesn’t mean you can’t also stay connected by phone, email, and social media. For some practical ideas, here are 4 Ways to Love the Difficult People in Your Life. Affirm your in-laws in front of your children. Even if there are challenges, don’t speak negatively about your in-laws to the kids. Avoid saying Grandpa D is a bad person for drinking too much. You can talk about how his actions harm himself and others without dishonoring him. Talk about how you have different values and ways of doing things in your home than your in-laws. Remember that, ideally, your marriage should bring the riches of broader family relationships. How have your in-laws been a blessing to your marriage and family? Share your experiences here.